You will find the Achievements Reports page on your WordPress admin area navigating to the GamiPress Reports menu -> Achievements Reports. 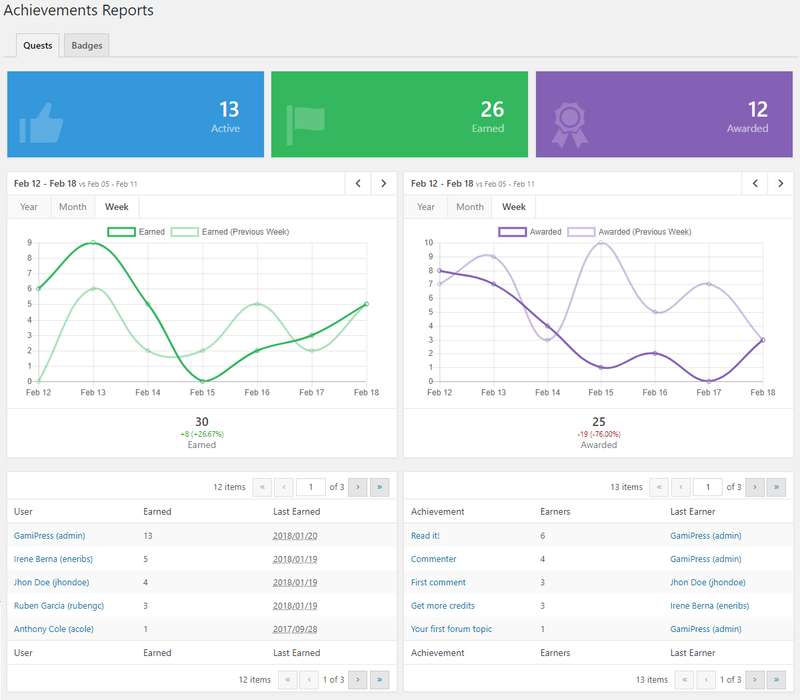 On the Achievements Reports screen you will be able to see data statics of each achievement type with useful information that will help you to detect increments or decrements in behavior related to achievements interactions. Number of achievements of this achievement type that are in active (publish status). Amount of achievements of this achievement type that users has been earned. Amount of achievements of this achievement type that has been awarded by administrators. Comparison chart with the amount of achievements of this achievement type that has been earned between time periods selected. Comparison chart with the amount of achievements of this achievement type that has been awarded by administrators between time periods selected. This report table, displays all users with the achievements amount they has earned of this achievement type by all the time letting you know which users has earned more achievements and the date of last achievement earned. The report table sort users by achievements earned, so you will see first users that has earned most achievements. This report table, displays all achievements with the amount of users that has earned it by all the time letting you know which achievements are the most earned and the last user that has earned it. The report table sort achievements by the number of times that has been earned, so you will see first achievements that has been earned more times.